When Nellie, a nurse from Arkansas, falls in love with a mature French planter, Emile, she learns that the mother of his children was an island native. Unable to turn her back on the prejudices with which she was raised, she refuses Emile’s proposal of marriage. Meanwhile, the strapping Lieutenant Joe Cable denies himself the future he wants with a Tonkinese girl because of the same fears that haunt Nellie. When Emile is recruited to accompany Joe on a dangerous mission, Nellie realises that she must seize her own chance of happiness, and is forced to confront her prejudices. Rogers & Hammerstein’s South Pacific. Music By Richard Rogers. Lyrics by Oscar Hammerstein II. Book by Oscar Hammerstein II and Joshua Logan. Adapted from the Pulitzer Prize-winning novel “Tales of the South Pacific” by James A. Michner. An amateur production by arrangement with R&H Theatricals Europe Ltd. It was a fab show so well done! Been this evening to see your show. South Pacific is one of my favourite shows and every song a show stopper. You were fantastic. Vocals spot on. Leads amazing and ensemble pieces fabulous; You should be proud. Beats the last professional performance I saw of it hands down. Well done. I’m a musician and also a HUGE musical fan, justice was done. Vocally it was wonderful and the huge band was a joy to hear. I may just have to go again. Excellent show, congratulations to everyone. South Pacific was fantastic!! Rachel James, Matthew Berrill, Susie Pack, Daniel Hodson, and special mention to ‘not so little any more’ little Conrad who opened the show and everybody else who I’ve not mentioned it was wonderful. Anybody who hasn’t booked yet: Get yourself down to the Derngate this week!! Well done to Martyn Knight and the cast of South Pacific – great singing, great production, I had a great night. Wonderful, just wonderful! Well done the cast and crew of South Pacific, it sounded great and looked great as well. Special mention to Rachel James, Matthew Berrill, Daniel Hodson and Susie Pack who all just owned the stage and had the audience so wrapped up in the story. A few standing ovations out there last night and here’s to many more over the rest of the week!! I didn’t really get musicals until this year. I had watched a few film versions and did enjoy them, but before Blood Brothers on 26th March this year, I had never seen one live. Since then I have seen five more, one of which was Blitz! (review here) by the Northampton Musical Theatre Company, a group formed of amateur performers very much on a level with a professional production. Blitz! was, rather obviously due to my lack of musical knowledge, completely new to me. However these people acting, singing, dancing and in the talented orchestra pit, playing, introduced me to a lovely musical, with catchy tunes. 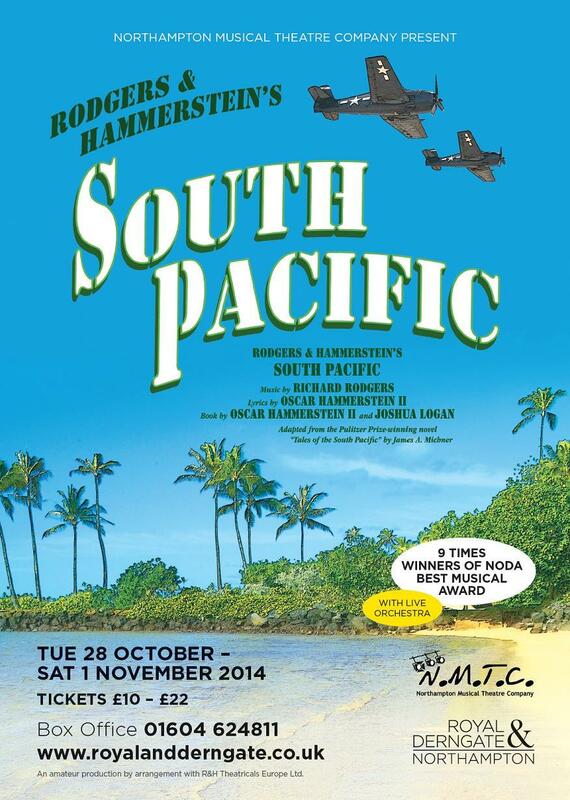 So I was back for more at Royal & Derngate this weekend for their production of Rodgers & Hammerstein’s South Pacific. It goes without saying that I have never seen it (not even the film), so once again all was mostly new to me. This time however, unlike Blitz!, some of the tunes were known (in the case of one, thanks to Captain Sensible). The glorious scene was set by the magnificent 21 piece orchestra led by Graham Tear as they presented the overture of the songs to come. Then curtain was up and “The Hammerstein Team” of the young and talented Abhisri Chadalavada and Oliver Knaggs performed “Dites-Moi” and the afternoon was clearly going to be full of entertainment. Rachel James as Ensign Nellie Forbush made a wonderful hick, sweet and delightful while her would-be love interest Emile played by Matthew Berrill was stunning, torn between his love and his contribution to help with the war effort. While everyone of the main cast were nothing short of excellent, the power of Berrill’s voice was simply incredible and without doubt the very best of the show. Susie Pack (so good in Blitz!) was once again excellent in her role of Bloody Mary, excellently performing the beguiling “Bali Ha’i” and her “Happy Talk” in particular was absolutely superb. Bringing the absolute amusement level to the high though was Dan Hodson’s performance of Luther Billis. Totally willing to put his all into the role, he wore the coconuts and grass skirt well. All the songs were performed to perfection with the stand out tunes being Berrill’s “Some Enchanted Evening” and the incredible group performance of “There Is Nothing Like A Dame”. The accents were also spot on, as was the clarity of speech from the cast. I have attended other professional productions this year where the speech lacks clarity and the accent a little heavy, so to be able to hear every word was magnificent. It was also a delight to see the Derngate 99% full in the stalls for the matinee that I attended. Such support for this group was lovely to see and I hope they all went home and told their friends how brilliant it was. Also myself and several others gathered at the end and looked over into the pit and stayed for the leaving performance of the orchestra. They don’t always get the credit they deserve, but they got another round of applause from me and the select few who stayed to the true end. Director Martyn Knight created a production of professional standard with his cast of exceptionally talented “amateurs”. It nothing short of amazes me that a production like this could be created with peoples own time and dedication and without doubt I wait with baited breath for the next opportunity to see them perform. The only Rodgers & Hammerstein’s I have ever seen has always been high quality PROFESSIONAL shows. Last night my youngest son played Corporal Hamilton Steeves and many other bit parts in the performance of South Pacific at the Royal & Derngate Theatre, Northampton. This was his first musical production with Northampton Musical Theatre Company; however from the Overture to the Finale, one would never have known that this is a show produced out of love for the theatre and musicals AND not for profit. The Orchestra sounded full and without error under the Musical Direction of Graham Tear who never fails to bring together musicians of quality. And yes, my friend Brendan J. Rayner wonderful on drums. Under the Direction of Martyn Knight this varied group of actors, dancers and singers brought to life the South Pacific. Earlier in the week, someone had given the show a ‘not so nice’ review, saying that the American Accents were not good. I must comment here as an American married to a Londoner about this as it irritates me to no end. WHAT IS AN AMERICAN ACCENT!? Like the UK it varies dependent upon where one grows up, Scots are not Welsh, Irish or Cornish and in London alone a variance from East to West. My accent does not contain the overused ‘Southern Drawl’ that so many actors have a tendency to be drawn to, I’m from California. Last night I heard ‘The Bronx’ ‘Los Angeles’ Mid-Western States and of course the South: voices from the 50 states, what I did not hear was a British accent. Which was much more true to life of the War in the Pacific. To me, a visit to the Derngate Theatre in Northampton is always a treat. It’s nicely modernised in a way that feels luxurious without the high price tickets to match! Parking is reasonably priced and within easy walking distance of the theatre. I was really keen to see South Pacific because even though I’m a child of the eighties, thanks to my grandparents I was brought up on the music from this show and was even taken to a performance of it on my teens. I was interested up see of this performance would bring back those memories for me. South Pacific is set on a paradise island during World War 2 telling the parallel love stories of Nellie, Emile Joe Cable and Liat. This show was performed by members of the amateur theatre group, Northampton Musical Theatre Company, the N.M.T.C so obviously I should review it as such… an armature production by people giving their time voluntarily. However, from the very start, this high quality performance bordered on professional, the sets were perfect and the costumes were fabulous. The acting and in particular the singing was mostly of a very high standard, especially if you take into account first night nerves! Dan Hodson taking the part of the comical Luther Billis and Susie Pack playing Bloody Mary were notably outstanding and every bit as good as you would expect from professional theatre. A definite highlight to this production is the live orchestra who played to a very high standard throughout. They turned what is fundamentally an amateur production into something else, again bordering on professional. We were treated to a medley of the shows classic songs prior to the start of the show and the orchestra continued to accompany each number. In fact they played near constantly adding atmospheric sound effects throughout. The second half of the show was even better, with the story becoming more involved and Luther Billis bringing more hilarious comedy moments! This show really brought back the memories from my childhood and I found myself singing along to all the wonderful songs! With ticket prices starting at just £10 this is absolutely worth a visit, especially with it taking place at the Derngate making it a very affordable special evening out. I give it a well-deserved 4 out of 5. “South Pacific” is probably one of the most popular musicals of all time. The music and lyrics of Rogers and Hammerstein certainly earn it that accolade. The musical is one of my personal favourites with some of the most beautiful music ever written for musical theatre. The director (and Choreographer), Martyn Knight has done great justice to “South Pacific” with the excellent staging and perfect casting of the show I was constantly reminding myself during the evening that this was an amateur production! Graham Tear the musical director, has once again put together an amazing orchestra of very talented musicians, the overture was so beautiful to listen to. The quality of singing from principals and chorus throughout the evening was to a very high standard indeed. I loved the choreography for the show this too was of a really high standard, well done. The sets for this production were stunning as were the costumes. Lighting and sound were exceptionally high quality throughout the musical. The hairstyles and makeup also added to the visual effect of the show. It was lovely to see N.M.T.C. performing at the Derngate Theatre again with this production of “South Pacific”. Congratulations to the entire company on an excellent opening night. I wish you all a happy and successful run and look forward to seeing you all again in the future. A shining light on the stage at the Royal and Derngate was without doubt Susie Pack’s performance of Bloody Mary. She displayed the consummate skills of a professional in singing, comedy, movement and timing. ‘Happy Talk’ was a delight to watch. Elsewhere there was some excellent singing from Rachel James (Nellie Forbrush), Matthew Berrill (Emile de Becque) and Michael Bowie (Lt. Joseph Cable). Dan Hodson (Luther Billis), an excellent comic actor [who] came into his own during the Thanksgiving scene, not least because of a pair of strategically placed coconut shells! The enthusiasm and energy of the cast was very enjoyable and many of the scenes finished on a terrific high! Everyone connected with theatre should always remember the old adage ‘leave your audience wanting more’ and judging by last night’s patrons that was exactly what NMTC achieved.